This will be a long post because I have not one, but three outfits to share with you today. Fabric Mart Fabrics was doing a mystery bundle pinterest challenge. 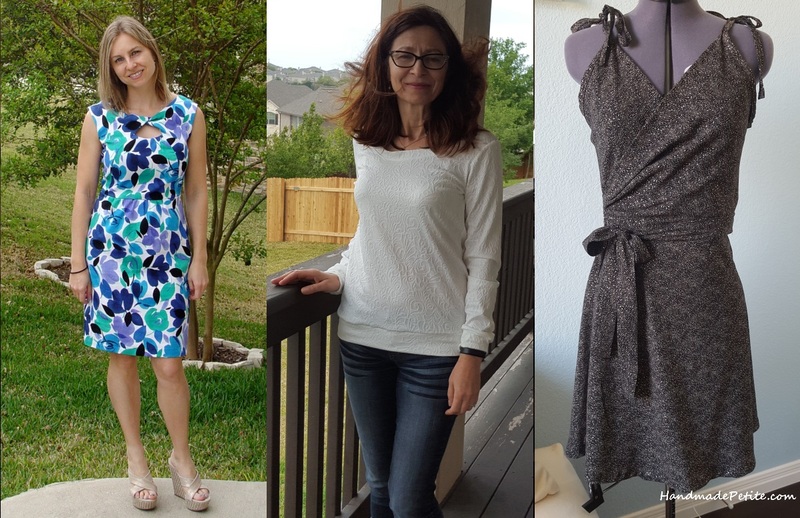 Two weeks ago I received 3 different fabrics about 2 yds each and came up with the following outfits. Both of the dresses were new to me patterns so they took a bit more time to make fit adjustments and muslins. The top was kind of tired and true. I made a similar one for myself a few months ago and wore it quite a bit, so I made this one for my mom. So here's a bit more detail about each. The first dress I made was Simplicity 1651. I made view B in the front and modified view D back with slim skirt. The fabric was just perfect for a spring dress - pretty florals and just thick enough that I didn't need to line it. As with most patterns, I went down a size from recommended measurements to get a better fit in the hips and bust. I had to shorten the bodice a bit since I'm sorter, but otherwise it fit pretty well. Another small change I made was get rid of one of the tabs in the back. I would have actually preferred to remove them completely, but decided to keep one and change the placement so I could strategically hide the bra strap. On the skirt the only change I made was switch out the back gathering for darts. Next time I make this, I will probably do the same in the front because in the stiffer fabric the gathers make the dress look a little puffy and less flattering. All in all though I'm happy with how it turned out and it was the perfect dress to wear to the Easter brunch. 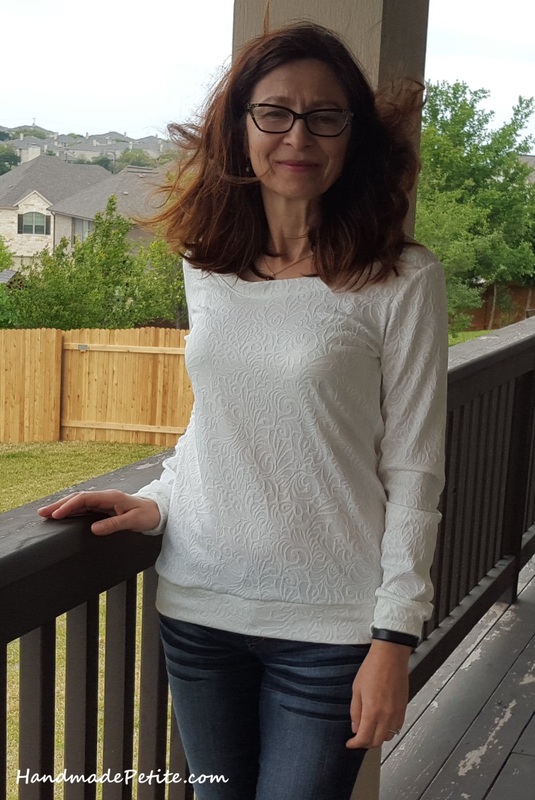 The Sewaholic Renfrew top was the quickest make since it's made from a poly knit and was sewn up on a serger and finished with a cover stitch in about an hr. The longest part was cutting out new pattern pieces in my mom's size. The sleeve on the picture looks a bit strange, but in reality it actually fit pretty well. My mom is taller, so the pattern fit her well as is. I made a similar top a few months ago for myself and had to shorten both the bodice and sleeves. Last but not least is Midsummer Night's Dream dress. The fabric bundle wasn't labeled, but I'm pretty sure this is a rayon challis or some sort of rayon blend. It has some shimmer to it and a bit of the glitter was left in the dryer after pre-treating it, but hopefully that will only happen the first time. I had a vision of a summer dress with spaghetti straps, but I didn't have the exact pattern in my stash. After some searching online, I ended up getting the PDF version of the Papercut Midsummer Night's Dream wrap dress. It was an interesting and pretty clever pattern with a hidden belt loop. I was between XS and XXS sizes, but as with most patterns erroring on the smaller side was the right thing to do. The only other change I made was shortening the the skirt by 3". 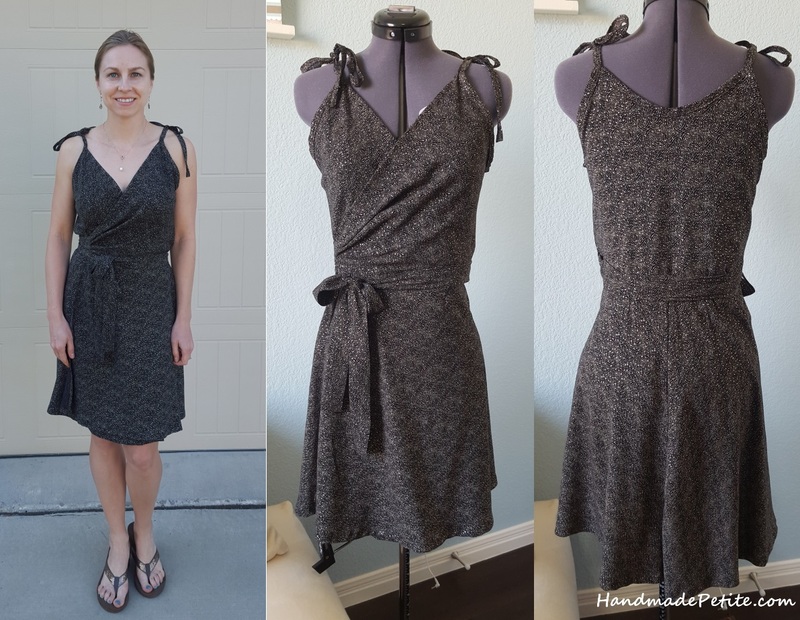 If I make it again, I may change the finishing to avoid making yards of bias tape, but I like how adjustable the pattern is and the fabric makes this dress super comfortable, but dressy at the same time. Plus, the fabric totally matches my glittery brown flipflops from VS. It was meant to be! Hi Olga, I am new to your blog and got the link as I was viewing on FabricMart. So love all the creations you made from the "Mystery Box" turned out awesome my fave was your blue brunch dress, thought that was stunningly beautiful! You got my vote! Hi Ronda, thanks so much for stopping by the blog and leaving a comment. I really appreciate it! The blue fabric was my favorite too. Each piece is very beautiful! You're use of the mystery fabrics was excellent!